A blog article or a book? Bob's pdf file can't really be regarded as a book. It's short on scientific references and long on Bob's pseudo-scientific quackery. When he does refer to scientific papers, he's just as likely to dismiss them out of hand as "alarmist science fiction". His book can only be called a book because it's so long. It's just a giant blog article in pdf form, of the sort you'll read every day on denier websites. It contains quite a bit of argument by assertion, straw man fallacies, conspiracy ideation, and various other telltale techniques of climate science denial. It's just to scare you: The grandeur of weather is being used by politicians and activist scientists to bludgeon voters and to frighten the gullible. On the very same page Bob denied that he believed in a climate conspiracy, right before he expounded another conspiracy theory: Unlike some persons, I believe in framing the evolution of the catastrophic anthropogenic global-warming movement as a logical progression…not as a conspiracy....The politicians found scientists to write those reports—so began the mutually beneficial relationship between climate scientists and politicians. The politicians wanted scientific support for their agendas and the scientists were more than willing to oblige because the politicians held the purse strings for climate research. Bob claims the mainstream media is part of the climate hoax: Mainstream media have been more than willing to add their attention-grabbing sound bites to global-warming news, in an effort to increase viewer/reader numbers and pump up advertising revenues. Like the relationship between climate scientist and politician/climate-science funder, there is a mutually beneficial bond between climate scientists and mainstream media. Predictions of gloom and doom from climate scientists help sell newspapers and help keep viewers tuned in to their networks and websites, which help maintain or increase advertising revenues for the news outlets. No denier worth his salt can leave out the money conspiracy: To assure that moneys were supplied from government coffers, needy scientists, with nowhere else to turn for their off-topic research, had only to include the terms global warming or climate change in their applications for research grants. Regardless of what field those scientists were studying, moneys flowed. Bottom line - it's one helluva giant conspiracy: Bottom line: When the promotion of global warming and climate change is viewed as a mutually beneficial relationship between politicians, climate scientists and the mainstream media, there is no need to frame it as a conspiracy. Bob Tisdale tells a big fat lie: The IPCC has never realistically tried to determine if natural factors could have caused most of the warming. ...As a result of that political choice, there is little scientific research that attempts to realistically determine how much of the warming we’ve experienced is attributable to natural factors. Bob makes lots of mistakes when he writes about global warming. There's the big one, of course, which is his trademark. He thinks that global warming is caused by blobs and El Niños. It isn't. (The word "blob" appears 80 times in his book.) The current warming is caused by our activities - with the biggest contributor being all the waste CO2 we are putting into the air when we burn up long-buried fossil fuels. The second law of thermodynamics says the heat will flow from the water with the higher temperature to the water with lower temperature. The warmer waters that had been driven deep into the ocean will cool as the heat flows to the surrounding cooler waters, and the cooler waters surrounding it will warm. Eventually, the water temperatures would equalize. That’s why alarmist claims of the heat coming back to haunt us has no basis in reality. It has established (and would simply establish in the future) a slightly warmer background state of the oceans—nothing more. You see, with global warming the earth heats up. If the heat isn't going down into the ocean, then it will hang about and warm the surface. Warmer ocean surfaces means warmer land surfaces too. So the heat will "come back to haunt us" because the world as a whole is heating up, and won't stop as long as we keep adding CO2 to the air. Now when a science denier doesn't even bother to read what "alarmists" are saying, then what hope have they of understanding climate science, let alone presenting it accurately? Quite a lot of Bob's book is comparing CMIP5 model experiment output with observations. He devoted 93 pages to Chapter 2 Climate Models, 11 pages more than his introductory blurb before Chapter 1 began :D. However Bob doesn't understand CMIP5 models or how to use and interpret the output. So his arguments are baseless, meaningless waffle. For one thing, he claims that models cannot be falsified, yet he spends an inordinate number of pages trying to "falsify" them. Of course they can be falsified. 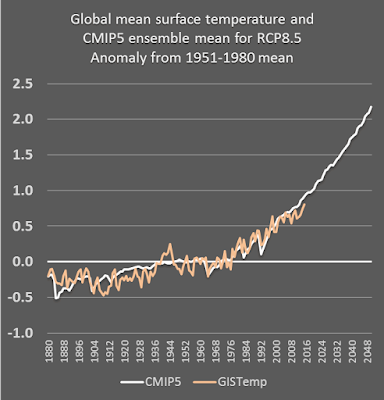 If the surface temperature projections from models were way off track from observations, then scientists would be looking to see what was happening in the real world and in the models to see what was causing the discrepancy. Even when observations are within the outer boundaries of model projections scientists have looked to see why they aren't right in the middle. And guess what - that's just what they've been doing. Scientists investigated the reasons for the so-called "pause" or "hiatus", which was a period this century when global mean surface temperature didn't rise as quickly as it had from the late 1970s to around 2000. They were looking at why observed temperature didn't rise as much as the modeled projections. (See also the seepage article). Some of it was because the estimated forcings in the models were too high. Some because of natural internal variability (the cool phase of the PDO). Yet the difference wasn't huge as you can see in the chart below. ...climate models used by the IPCC for their assessment reports were not created with the intent of simulating Earth’s climate. In other words, climate models do not include naturally occurring processes that can cause global warming to occur on annual, decadal and multidecadal timeframes. The current projection method works to the extent it does because it utilizes differences from one time to another and the main model bias and systematic errors are thereby subtracted out. This assumes linearity. It works for global forced variations, but it can not work for many aspects of climate, especially those related to the water cycle. 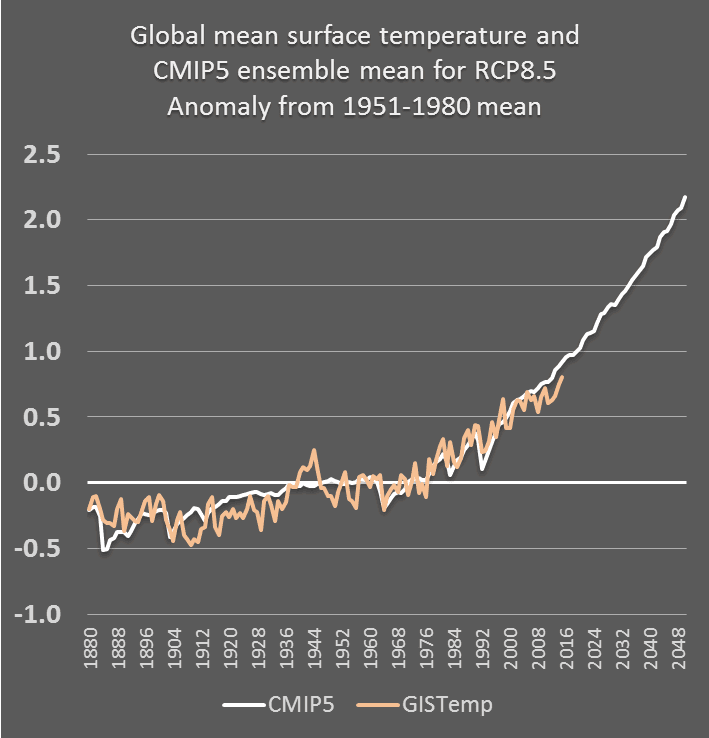 The CMIP5 climate models were developed to give scientists insight into climate, and to project what is likely to happen under different emission pathways. There are different models and different experiments for different purposes. Most CMIP5 model experiments include known forcings up to 2005. From 2006 onwards, estimated forcings were incorporated. If the actual forcings differ from what was put into the models, then the results will be expected to differ somewhat from the observed. If you want to learn about climate models, there are some good references below. Bob's "evidence" that the "IPCC has never realistically tried to determine if natural factors could have caused most of the warming" demonstrates that he hasn't properly read or understood the IPCC reports, which go into considerable detail about how scientists have been able to determine how much climate change can be attributed to natural forcings (such as solar and volcanic) and how much to anthropogenic forcings. It also demonstrates that he doesn't understand the difference between climate models and weather forecasts. We know this is fact because the current generation of climate models—the most complex climate models to date—still cannot simulate naturally occurring ocean-atmosphere processes that can cause Earth’s surfaces (and the oceans to depth) to warm for multidecadal periods or stop that warming. If misuse of the data is to be avoided, then it is also important to understand some of the fundamental limitations of the simulations produced by the models. Here four potentially complicating issues are briefly discussed. Climate drift and bias correction - "Below the seasonal thermocline, the ocean requires thousands of years to fully adjust to any change in external forcing. This means that the typical several-hundred-year CMIP5 control simulation, which attempts to determine the equilibrium climate for preindustrial conditions, is generally too short to eliminate residual drift (toward an eventual equilibrium). The drift may or may not significantly affect analysis of any particular aspect of the CMIP5 runs, but users should not prima facie assume the drift is inconsequential." Climate noise and “downscaling.” - Bob picks areas out of the models, with no regard to downscaling limitations as described in Taylor12: "In general, careful researchers may wish to avoid consideration of downscaled information from the CMIP5 models unless they have become sufficiently aware of the limitations of both the global models and the downscaling methods." Multimodel ensemble - "In general, users of CMIP5 output will have to become familiar with all the model differences and variations on the experimental conditions before attempting an explanation of the spread in simulation results." Unforced variability. In addition to responding to “external” forcing (attributable both to natural causes, such as volcanic eruptions, and to anthropogenic activities, such as fossil fuel burning), climate exhibits variations solely due to internal interactions within the complex nonlinear climate system. These unforced variations must be taken into account to sensibly analyze the CMIP5 output. Examples of quasi-regular internal climate variations of this sort are the El Niño events, the North Atlantic Oscillation (NAO), and, on shorter timescales, the Madden– Julian oscillation (MJO). There are, however, other variations occurring on a variety of time scales that may be much less regular (e.g., a record cold December). A realistic climate model should exhibit internal variability with spatial and temporal structure like the observed. In the long-term simulations, however, the timing of individual unforced climate events will only by coincidence match observations. For example, the El Niño years in a “historical” climate simulation will rarely (and only by chance) coincide with years when El Niños have actually occurred. This is because the historical runs are initiated from an arbitrary point of a quasi-equilibrium control run, so internal variations (even if they were perfectly predictable) would not be expected to occur at the same time as those found in the observational record. Analysts comparing model simulations with observations should take this expected discrepancy into account and not naively attribute it to model errors. In contrast, in the AMIP simulations, sea surface temperatures are specified, based on observations, which guarantees that the occurrences of simulated historical El Niño events coincide with observations. In these runs it is possible to directly compare with observations a model’s atmospheric manifestations of El Niño conditions, but agreement will still be limited by atmospheric variability not tightly coupled to SSTs. So Bob is wrong over and over and over again right throughout his new book. The current generation of climate models do simulate natural variability. The timing is not the same as the timing in reality, but that's because weather is chaotic. Climate model experiments include long term projections. For those models, it's the multi-decadal projections that are important, not whether an ENSO event took place in 2015 or 2017. There are also shorter term experiments, where models are initialised with recent observations. Risbey et al. (2014) have noted a major flaw with the climate models used by the IPCC for their 5th Assessment Report—that they are “generally not in phase with observations”. Remarkably, they don’t accept that as a flaw. A key difference between a climate forecast and a climate projection is that the former attempts to account for the correct phase of natural internal climate variations whereas the latter does not and can not. Bob's ignorant pronouncements are typical of pseudo-scientists and science deniers. Decent researchers try to understand what they are dealing with before drawing conclusions. As you'll have heard, extraordinary claims like the ones Bob Tisdale peppers throughout his book and various blog articles, require extraordinary evidence. Bob makes extraordinary claims but fails to deliver on the evidence. It is Bob's ignorance that causes him to dismiss research that uses models to work out what is likely to happen as the world warms. For example, he wrote about a number of papers considering how ENSO events may change, dismissing them as "science fiction". Bob is well-versed in science fiction. That's what he does. What he is not expert in is real science. As pointed out above, long term climate model outputs can't and don't show the internal variability at the same time as it might be happening. They aren't initialised with recent observations. There's another thing that happens when you average the surface temperature output from multiple model runs. It's like with anything - you'll smear the regional variability. Bob Tisdale makes this mistake throughout his book. Where there's a strong ENSO event happening, by averaging the model outputs, one result that might purely by chance show an El Niño at the same time, will be offset by another model output that might show cooler temperatures in the same region at that particular time. What that means is that the bulk of Bob's book is worthless, since the bulk of it is showing observations of regions of the globe against an averaged set of model outputs. When I started this study, I asked one of my students to attempt to measure how many bugs there are in a typical climate model. We know from our experience with software there are always bugs. Sooner or later the machine crashes. So how buggy are climate models? More specifically, what we set out to measure is what we call “defect density” – How many errors are there per thousand lines of code. By this measure, it turns out climate models are remarkably high quality. In fact, they’re better than almost any commercial software that’s ever been studied. They’re about the same level of quality as the Space Shuttle flight software. Actually, it's the reverse if anything. By using recent periods as the baseline, science deniers can forget that the world has warmed a heck of a lot since pre-industrial times. They can take delight in arguing that the world has only warmed 0.05 °C since the last time there was a record hot year (last year!). Or that it's "only" 0.7 C hotter than the 1961 to 1990 average. Or better yet, that the temperature of the lower troposphere (not the surface) is only 0.24 °C above the average for 1981 to 2010. The chart below will surely throw Bob into a spin of denial. 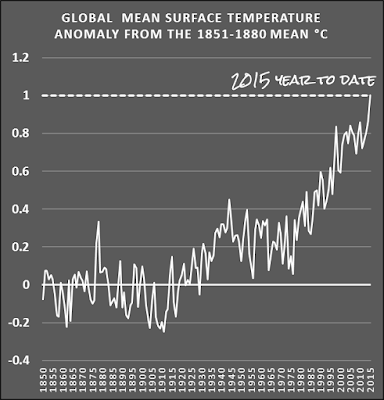 I've plotted the global mean surface temperature using as a baseline the period from 1851 to 1880. 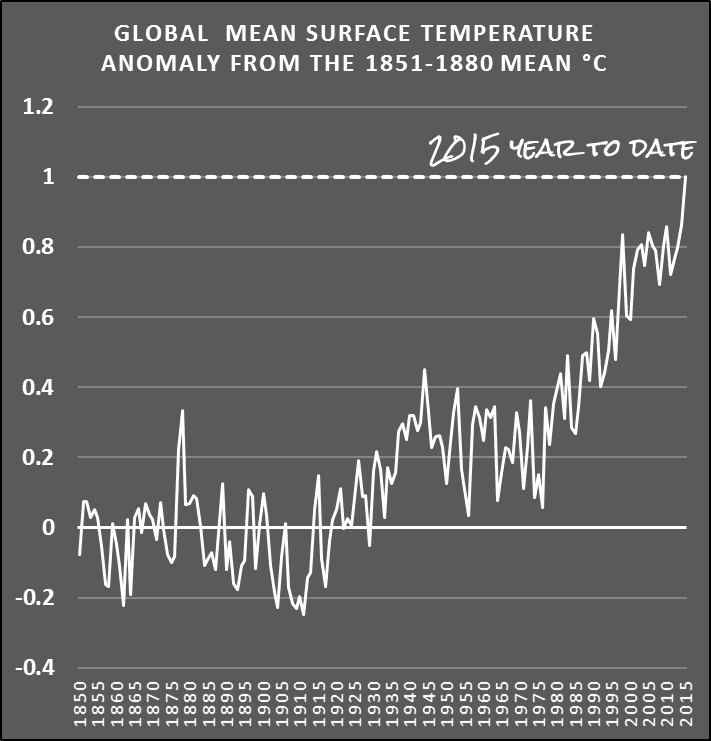 The year to date for 2015 is 1.1 °C above that average. And it won't stop warming for some time to come. Taylor, Karl E., Ronald J. Stouffer, and Gerald A. Meehl. "An overview of CMIP5 and the experiment design." Bulletin of the American Meteorological Society 93, no. 4 (2012): 485-498. doi: http://dx.doi.org/10.1175/BAMS-D-11-00094.1 (open access) - this is quite easy to read and provides a really good overview of CMIP5 models, which were developed and used in the IPCC AR5 report. TEDx talk: Should we trust climate models? - Transcript and video of computer scientist Steve Easterbrook talking about climate models. Well worth reading and/or watching. I suspect that those who can't do science, or understand the science, or accept the results - choose to identify themselves with the connedspiracy crowd, seeking their own platform of utter nonsense and stupidity. You're review NAILED it. Nice job! Yes, he is a bully and a jerk. I discovered that when I questioned some of his reasoning on a blog - he went full ad hominem. In my opinion he is a fraud, nothing more. The problem isn't that Tisdale writes all this pedantic bloat, the problem is that Google indexes it and so when people search on terms such as ENSO and El Nino they end up on WUWT and become horribly misinformed. It really becomes the blind leading the blind. -tisdale transforms google images. He does have a few resources I use. People who end up at WUWT and *stay* were probably in search of someone to fool them from the moment they decided to grab their keyboard. To take such places seriously you have to be willing to disregard sources like NASA, NOAA, or any other scientific organization that reasonable people would expect to be credible. By that point you are already in conspiracy territory. That is a nuisance for you. Wayback machine is clunky, sometimes has formatting problems, and takes more time than archive.is. And I can't link directly to particular points on the page like I do with archive.is. So no promises. Sorry. Can I suggest you do a google search and click the cache version (the arrow at the side)? How about Web citation? Although the data is likely more secure in Island. Maybe try a VPN like CyberGhost so you can access via a proxy server in another country? Oh, I was thinking of webcitation when I commented. It's the one that's clunky to save pages on. I'll try to remember to link to the cache in the future (like this), as well as the archive.is version. Or use the wayback archive if it's not yet been cached. Okay, thanks. I was not aware of that linking to a particular section of a page which obviously is neat. No need to make double work for me only a this does not appear to be more wide issue. I'll try that CyberGhost thing.. Apparently you can use services like Google Translate to act as a proxy. Scientists would be unable to distinguish human factors from natural factors if they didn't understand the natural factors affecting climate. Sadly, this doesn't counter the 'skeptic' argument, which is that the IPCC doesn't even try to distinguish between natural and human factors--they simply assume it's all down to us. It's pretty much impossible to argue with logic like this. "It's very long, running to 733 pages." "Hmm. This suit smells of dead germans and cat piss, and is sturdy enough to both restrain a rutting wart hog and give me heat-stroke if the mercury climbs above 60 degrees, my good man". "Never mind the quality, feel the width my son! They don't make cloth like this anymore!" Phrase used to persuade you that quantity is more important than quality. "Bob Tisdale tells a big fat lie: The IPCC has never realistically tried to determine if natural factors could have caused most of the warming. ...As a result of that political choice, there is little scientific research that attempts to realistically determine how much of the warming we’ve experienced is attributable to natural factors. " 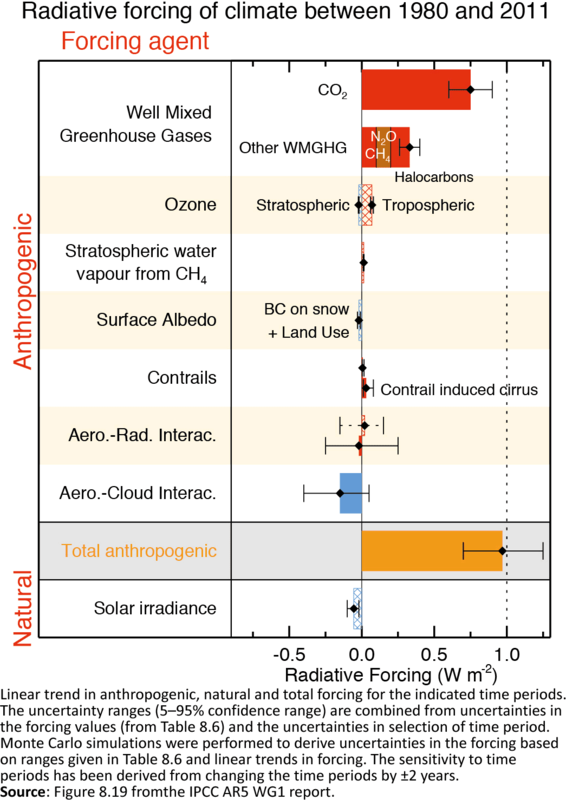 Seriously.... IPCC AR5 WGI dedicates a full chapter (ch 10) to detection and attribution.